Boasting the same great interior design as their other townhouses, the medex trim cat townhouse from The Cat’s Inn offers shelters, clinics and other business a convenient, safe and secure option for boarding cats. Standing 7 feet, 7 inches in height, each unit includes 28 square feet of space for cats to play and exercise or to nap and relax. Conveniently placed steps between levels make it easy for kittens or elder cats to move between levels, from the secluded bottom floor with an out-of-sight hiding area and litter box space to the top floor that offers cats an elevated look at their surroundings. Each unit also features The Cat’s Inn’s patented ventilation system (No. 6,318,295 b1) which removes airborne diseases and bacteria as well as litter box odors. 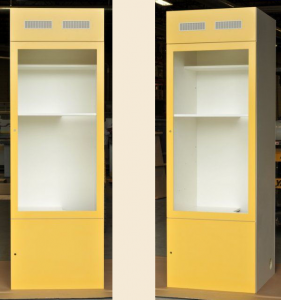 Constructed with a melamine interior that is easy to clean while also preventing absorption of odors and liquids, these cat townhouses are available in 70 colors to match the décor of any room in your clinic, shelter or cat-related business. Customize your townhouse with an all-glass back panel to give cats even more visual access, or add tinted glass to minimize the light in a sunny room. Pass-through doors are also available to give cats access to adjoining units, while accessories like The Cat’s Inn’s four-post cat bed with mattress can be added to give cats a cute and comfortable place to take their naps. To learn more or to request a quote, call The Cat’s Inn today at 877-228-7466. 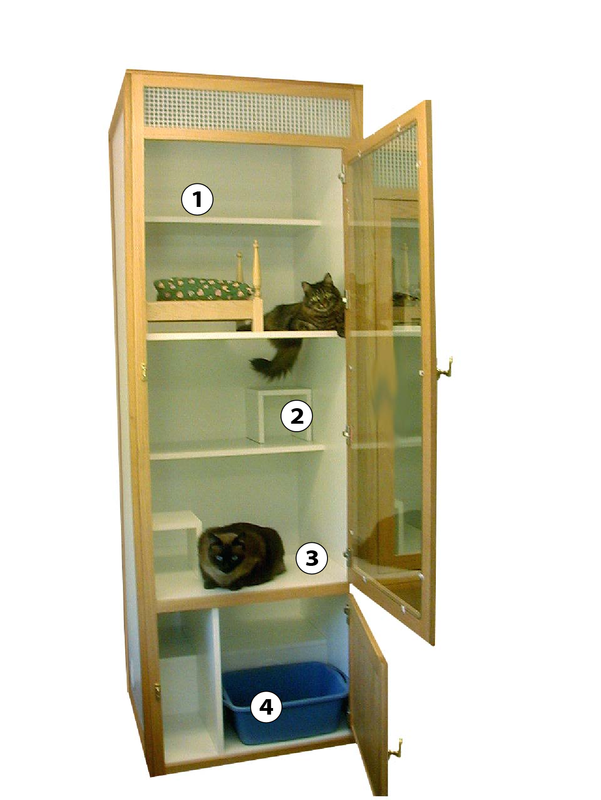 Six levels for them to explore with a total of 28 square feet of flat living space that can hold up to three adult cats or more if they are younger. 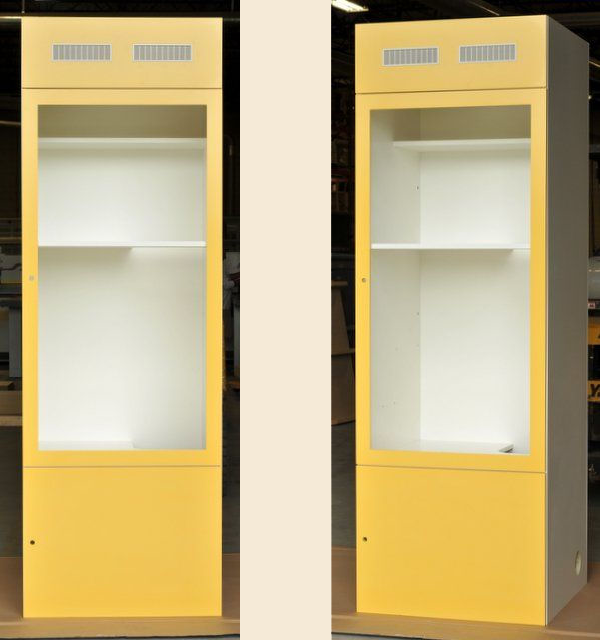 Check out our stackable unit too! 4 poster bed in oak, maple or cherry with washable mattress. – view more info on our cat beds. 1. 6th level gives cats the height that they crave to view their surroundings. 2.Steps make it easy for kittens and older cats to maneuver from level to level. 3. 3rd level dining and lounge area. 4. This area houses the litter box with the ventilation system and a 2nd level hide away for cats to get away without being in the litter box. Also included is the storage area for each cats personal belongings. All hidden behind a solid door to provide the privacy that cats thrive.